The Kobo Glo HD isn’t Rakuten’s most recent e-reader. At the time of this review, that title belonged to the Kobo Aura One. It’s not the company’s least expensive e-reader, either—that would be the Kobo Touch 2.0, which we hope to review soon. The Kobo Glo HD is, however, Rakuten’s most well-rounded E-Ink device. Priced at $130, the Glo HD incorporates many of the more desirable features of the pricey Kobo Aura One at a price point that puts it closer to Amazon’s special-offer-free Kindle Paperwhite ($140). Pick up the Kobo Glo HD and the first thing you’ll notice is how good it feels in your hand. Its backside is covered in a layer of grippy, perforated rubber that makes the device easy to hold. On the downside, that material did prove difficult to keep clean during testing, picking up fingerprints and filth from coffee shops far more easily than the smooth plastic bodies of other e-readers we’ve tested. 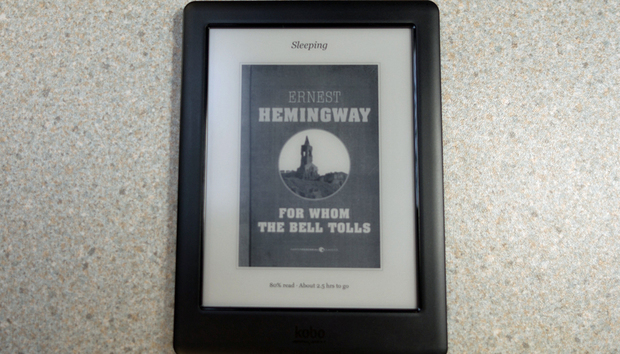 The Kobo Glo HD measures 6.18 x 4.53 x 0.36 inches, and it weighs just over six ounces. 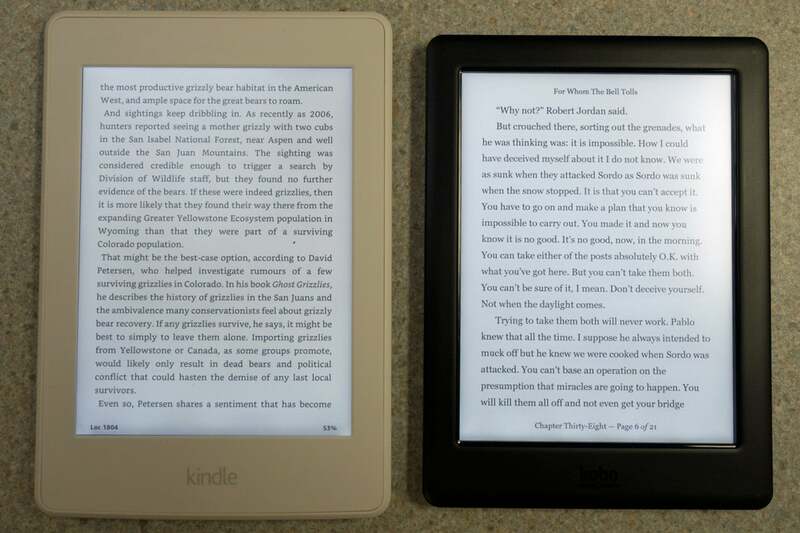 That’s the same heft as the Kobo Aura Edition 2, but it’s lighter than Amazon’s Kindle Paperwhite. So it’s no big deal to hold the Glo HD during extended reading sessions, even if you’re cursed with president-elect-sized hands. The Glo HD feels sturdy enough, but I noted a couple of issues with its build quality that caused me some concern. First, the device’s mini USB charging/data port didn’t align with the hole in the Kobo Glo HD’s cover. I’ve seen this sort of thing lead to the port becoming detached over time. Second, and less troubling, there’s a seam along both sides of the e-reader’s rubber back plate where it meets the rest of the device’s enclosure. After a couple of days, I found these seams got jammed up with debris that was floating around in my backpack and had to scrape it out with a knife. he Kobo Glo HD is as close to a Kindle Paperwhite as you can get, without buying a Kindle Paperwhite. As with the rest of Rakuten’s current lineup of E-Ink devices, the Kobo Glo HD doesn’t suffer from an abundance of buttons. Most of your interactions will be made using its touchscreen, with the exception of turning it on or off. The Kobo Glo HD’s power button, which is recessed into its top, is easy to press intentionally, but difficult to hit accidentally. And as with all E-Ink devices, the Kobo Glo HD sips power. A single charge of its battery can get you through up to two months of use—though your results will vary depending on how much and how often you read. The Kobo Glo HD comes with a 6.0-inch touchscreen that splits the difference between readability and energy efficiency. With resolution of 300 ppi, text appears crisp and just as legible as what you’ll see on the Kobo Aura One or on Amazon’s Kindle Paperwhite, Voyage, and Oasis. And Rakuten makes it easy to tweak text size, font settings, and line spacing. Like all Kobo e-readers, the Kobo Glo HD provides 11 font choices and 48 text sizes. Font height and sharpness can be adjusted, too. I also found that JPEG and BMP files, as well as images embedded in PDFs, looked great even if they weren’t originally grayscale. The Kobo Glo HD’s backlighting failed to impress me, however; in fact, it’s a complaint I have across the Kobo product line. Lighting is consistent across most of the display, but the e-reader’s normally sharp text becomes slightly blurry if the backlight is pushed beyond 40 percent. This isn’t a deal breaker, but it is disappointing. The Kobo Glo HD’s recessed button makes this e-reader difficult to turn on by accident. The Kobo online ebook store isn’t as comprehensive as what Kindle users enjoy through Amazon’s Kindle ebook marketplace, but it offers a large enough variety of reading materials to keep most people happy, provided their reading tastes don’t lean towards the esoteric. And all Kobo e-readers support Pocket and OverDrive integration, allowing you borrow digital books from your local public library and read saved offline content harvested from the web. As useful as these two features are, they feel like a stopgap measure designed to compete with Amazon’s excellent subscription Kindle Unlimited Service—an all-you-can-eat book buffet. It’s also important to note that Kobo’s online store provides no access to periodicals. If you’re interested in reading newspapers or magazines on your e-reader, you’ll want to consider shopping for an Amazon device instead. Attempting to read a graphics-heavy PDF copy of Foreign Affairs on the Glo HD proved frustrating, to say the least. The Kobo Glo HD can open a broad array of document and image files, including EPUB, EPUB3, PNG, GIF, JPEG, BMP, TIFF, HTML, MOBI, PDF, TXT, HTML, RTF, CBZ and CBR—provided they’re not protected by any form of DRM. I found that the performance of these files on the e-reader varied greatly. EPUB, MOBI and text files all opened up quickly and were responsive to my input. Reading PDFs, as in the example above, was a laggy nightmare. No matter what you prefer to read, the Kobo Glo HD should provide you with Ample room to store it. While it doesn’t come equipped with the ability to use removable storage like the Kobo Aura H2O does, its 4GB of internal memory is spacious enough to hold thousands of books and documents. The Kobo Glo HD is a good option for those who prefer to find their reading material online, through their local library, or who just don’t like the idea of filling their electronic library with Amazon’s DRM’d content. It offers all of the features most people might find desirable in an e-reader, without any of the unneeded bloat.